Australian tea tree (Melaleuca alternifolia) is a woody plant that produces an essential oil with antiseptic, anti-bacterial, anti-fungal, and anti-inflammatory properties and is widely formulated into many products. Yield and financial analyses were done to compare the viability of replanting 20 ha tea tree plantations using elite clones and improved seedlings over a 15 year time frame were carried out. Four plantation options were modelled: (1) plantations established using genetically improved seedlings (ATTIA 2B) planted at a stocking of 33,333 plants/ha and (2) 16,667 plants/ha, (3) plantations established using the best three selected clones planted at a stocking of 33,333 plants/ha and (4) 16,667 plants/ha. Financial analysis showed that, at an oil price of $45/kg (as at Sep 2008), replacement plantations of either elite clones or improved seedlings are both highly profitable irrespective of the stocking employed. The Net Present Values per hectare at 7% discount rate was $107,824, $63,640, $163,162 and $104,055 for plantation options 1, 2, 3 and 4, respectively. Plantation option 3 was predicted to give the greatest profit at any of the oil prices tested, followed by plantation option 1, 4 and 2. The break-even prices for tea tree oil production, using the production parameters in this model were $11.81/kg, $15.19/kg, $10.72/kg and $12.96/kg for plantation options 1, 2, 3 and 4 respectively. ATTIA members Craig Chapman, Rob Dyason and Glen Donnelly kindly provided costings for the financial analyses which were collated with the help of Gary Baker of Wollongbar Primary Industries Institute. Infrastructure support came from Southern Cross University and NSW Industry and Investment through the RIRDC/ATTIA tea tree breeding program. This work was undertaken as part of an MSc degree by Prastyono. Thanks are due to the Australian Centre for International Agricultural Research for the John Allwright Post Graduate Scholarship awarded to the first author. B.J. 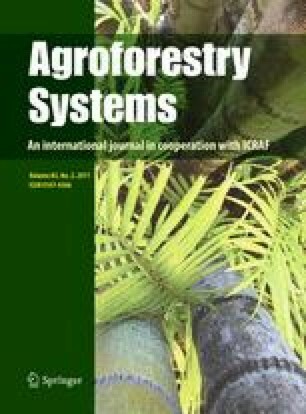 Lepschi and Milos Ivkovic of CSIRO Plant Industry provided helpful comments on an early draft of this paper.